The South Asia, arguably the most densely populated part of this planet, hosts about 24% of the world’s population within only ~4% of the total global land area. 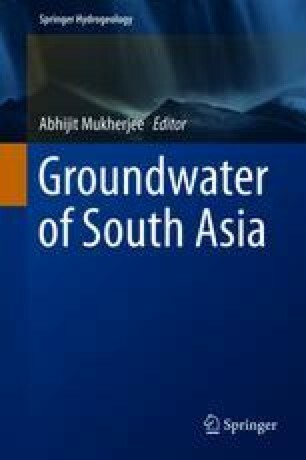 Although the region encompasses three of the most extensive riverine systems of the world (Indus, Ganges, and Brahmaputra river basins) that host several of the high groundwater-producing aquifers of the globe, the availability of safe and sustainable groundwater in the region is not consistent, and there is a growing concern about the accessibility of safe water in many of these aquifers (e.g., Ganges basin) due to presence of geogenic pollutants. Moreover, the groundwater from these trans-boundary aquifers has become a politically sensitive issue. The region is also the most extensive user of groundwater resources in the globe, leading to severe concern of groundwater availability, even for groundwater affluent aquifers. Several anthropogenic activities, particularly irrigation (accounts for >80% of the groundwater withdrawal), lead to groundwater depletion in most of areas within the region. Varying precipitation rates and subsurface hydraulic condition are providing more challenges to groundwater governance. Widespread occurrences of geogenic groundwater contaminants along with emerging pollutants, increasing food demand associated with growing population, and effects of climate change further complex the scenario toward sustainable groundwater resource management.